Once again, a stranger's hands reach out and grab at my bag. I am startled, but quickly realize this is not an attempted mugging. "Te ayudo?" they ask, and without waiting for an answer, my heavy suitcase if lifted out of my hands and hoisted to the top of the staircase. Such is the way of Colombia. Maybe I lived in New York and Spain for too long because – and how sad this is – I am repeatedly shocked by how consistently nice, helpful and welcoming everyone is here. This is not an exaggeration: I left a yoga class on Thursday night with email addresses and phone numbers for 5 different people: call me if you need anything. Let's get a coffee tomorrow. You must come eat a meal at my home. My cousin is in Bogota, contact her, she will show you around. Next time you visit Medellin you stay with me ok?... etc., etc. It took me 3 years to make any friends at all in my yoga classes back home, and yet all this in a matter of one hour. And it's not uncommon: I have received offers such as these throughout the past two weeks, particularly in Cartagena, and the offers always seem genuine. Within minutes of meeting, complete strangers have taken me for drinks and for lunch and for walks, and have thus become, at the very least, future Facebook friends. And as for the bag-carrying, well if this is what a machisto culture means, then I will not complain. I have already come and gone from Medellin. It was a quick trip but one that was well worth the visit. What a fantastically progressive city Medellin is (pronounced Meh-Deh-Yeen, or with the beautiful Colombian accent, Meh-Deh-Jeen). 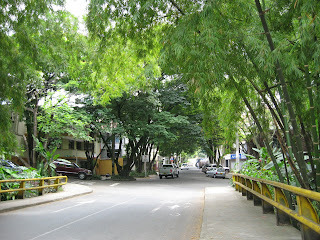 And compared to the rest of what I have seen in Colombia, the city is so... mainstream. It really could be AnyCity USA, with its numerous parks, wide lane roads, Japanese cars, gleaming high-rise buildings, huge suburban shopping malls and a fast and sleek metro system that runs the length of the valley. There is nothing colonial, quaint or "typical" about Medellin, and I think the local paisas want it that way. Medellin sits in one long, narrow valley that extends north to south, with numerous homes snacking their way up into the surrounding hillside. At night, the entire city lights up; the view from above is spectacular. With its high-class art, fashion and restaurant scene, and numerous international festivals of all kinds, Medellin clearly has lofty goals of greatness, and the city's hope for making its place on the global – rather than the Colombian – stage is palpable... but is very much threatened to be held back by the pervasiveness of young men sporting mullet haircuts. Yes my friends, I said mullets. I haven't seen this many tails since I last went to a zoo. If anyone out there can explain this strange phenomenon, I would be thrilled to know WHY. Anyway, I treated myself to two nights at the zen-like Global Hostel in the Poblado neighborhood of Medellin, a leafy and residential area dotted with designer shops, art galleries, nail salons and funky cafes. And just around the corner, I spy a yoga studio! Here in Poblado I am in heaven, completely chillled out and blissfully unaware of the prevalance of (cheap) cocaine use all around me. As the middle-upper class zone, Poblado is where the night happens – the five city blocks surrounding Parque Lleras are literally packed with a hopping bar and restaurant scene that is almost too cool for itself. With thumping music ranging from Coldplay to Son Cubano, every single bar is open-air with outdoor seating; a testament to the permanently perfect, spring-like weather this city enjoys. Locals are always dressed to kill (well, at least the women are), with curvacious, bodacious, surgically enhanced bodies to match. Guys are boring in jeans, t-shirts and mullets. But the female look is way more fun: high heels, tight jeans practically painted over enormous rear ends, and much-too-small tops held up by some of the biggest breasts I have ever seen. I have never felt so flat in my life. But not all of Medellin is so cool or prettyfied. The center of town is a completely different story: hectic, crowded, bustling and overwhelming, this area is literally one huge marketplace – packed with people, traffic, and tons and tons of crap for sale. Think Canal Street in Lower Manhattan, times 20. I suppose if I were writing this piece for a travel guide, or hosting my own travel series, I would take you there. But I am not. So I won't. 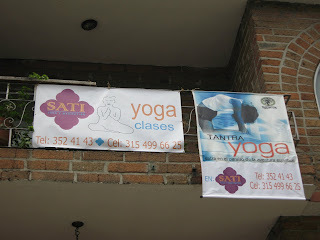 Instead, come with me as I ommmmm my way through a hatha yoga class at Sati Yoga on Calle 10. Sit me with as I people-watch and enjoy a Cappuccino spiked with Bailey's at the uber-French Café El Bon. Chill with me as I devour a nutella and banana crepe in Parque Lleras. Sightseeing is oh, so last week. This is one girl who needed a break from being a tourist. I am happy to report that I found that break in Medellin. Great piece. Medellin is a paradise being discovered by more and more people each and every day. Thanks for stopping by.